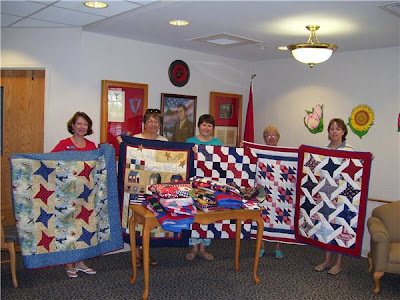 Today, on behalf of our guild, a few of us went to the Veteran's Home and distributed 30 patriotic quilts to the new residents there. We go twice a year in June & November to bring quilts to those who have been admitted since our last visit. It is a very rewarding experience to honor their service. And they are so grateful to receive a gift from the heart. That is wonderful! I am sure they appreciate it greatly. My mother is in a nursing home. I know she (and I) appreciate all the things people do for her and other residents. They look like they're a good size for a resident sitting in a chair or wheelchair. I'm sure they'll be loved. This must be the time of year for patriotic quilts - I machine stitched the binding on my Patriotic String Star today. I want to have it finished for the WI/MN area HeartStrings sew-in in July. We'll be working on some Quilts of Valor.